1906 where there had only been 100 the year before. This is a commercial novelty embossed divided back photographic postcard. The couples on the front of the card are models. Nothing indicates the manufacturer of the card. It is obvious that some things never change. Getting your husband to write you when he is away from home is obviously one of them. I am intrigued by postcards; these little snapshots in time. The sender and recipient hopefully knew what was meant by the correspondence, but we may never. Benjamin Franklin (1706-1790), publisher, scientist, diplomat, and first postmaster general of the American colonies, is honored on the 1-cent stamp. This stamp was used most often to send postcards. 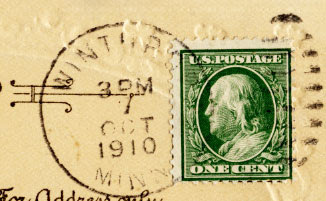 The first 1-cent Franklin of the Third Bureau Issue (which this stamp corresponds to) rolled off the presses in the late fall of 1908. When retired, over 14 billion had been used. Smithsonian Postal Museum. 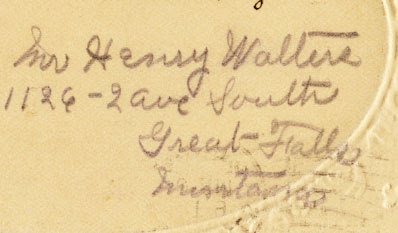 The 1910 Census for Montana contains an entry for a Henry Walters. He is a single 28 year old copper miner boarding in Silver Bow County, Montana. Great Falls is in Cascade County, Montana. This may or may not be the Henry Walters of our postcard. The card was mailed in October and the census taken in May. This would certainly allow enough time for Henry to marry. The census taker may have assumed he was single as he was a boarder in a boarding house. More information would be required to confirm this is our Henry. I found what the Wife has written very interesting. The kissing couples on the front are less than subtle. She is obviously missing her husband. 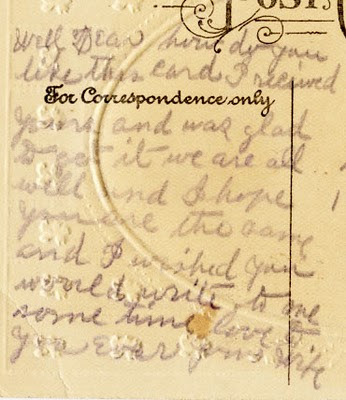 In this message she acknowledges his card, but wishes he would write to her sometime. Did Henry send a card to the "all" mentioned? 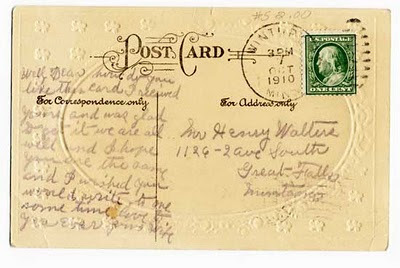 Is Wife living with Henry's parents and he wrote to them all rather than to his Wife? How I wish I knew. Whist is a trick-taking card game originating in the early 17th century which was played widely in the 18th and 19th centuries. In the middle of the 18th century, whist was regularly played at the coffee houses of London and in fashionable society. By the late 19th century an elaborate and rigid set of rules detailing the laws of the game, its etiquette and the techniques of play, had been developed that took a large amount of study to master. In the early 20th century, bridge, which shares many traits with whist, displaced it as the most popular card game among many card players. There are hundred of books written detailing the rules of the game and it's popularity. 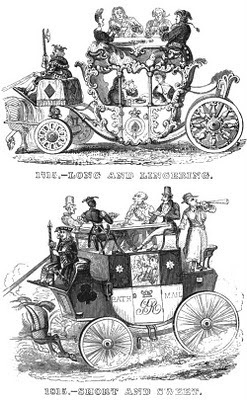 The woodcut below came from such a book and show that the game was so popular it was played during carriage travel. Yes, I think we can all see why kissing is better than Whist! Anonymous. Better Than Playing Whist. Postcard. Unknown 1910. 1910 U.S. census, Silver Bow County, Montana, population schedule, Silver Bow, p. 104, dwelling 283 , family 287, Eliza Pearl (Head); digital images. Ancestry.com (http://ancestry.com/ : retrieved 19 February 2010); citing NARA microfilm publication T624, roll 836. Vaule, Rosamond B. As We Were - American Photographic Postcards, 1905 - 1930. Boston: David R. Godine, 2004. Anonymous. "Postcards For Every Use." The Sun. December 2, 1906. Online archives The Library of Congress : 2009. For the Festival of Postcards - Light - February 2010. I absolutely love this postcard. Once again, you have given us a window into the past! Thank you Lori, I too love this postcard. I just wish I knew the whole story. There's more there, I just know it. *sigh*...oh, wistful indeed! I can feel that poor woman's disappointment at not having heard from her husband! I did notice that it might read "would write to me" rather "would write to one"... the first stroke of her lowercase "m" is a little confusing. It is hard to tell if it is one or me. Either way, I wish that man would write and put her out of her misery! Glad you loved it too.